...WOW! Yes it really has been that long...has this year gone by insanely fast or am I just in my own little world? So yes I have been on hiatus. We had so much going on I was insanely busy at work, everyone including me got sick and then the holidays. Tucked inside that I had a ton of pictures around the holidays. So I took a little down time after getting everyone their pictures and we did get a chance to have a really good Christmas, although there were days that I thought I might deck the next person that asked if I was ready for Christmas...uh no. But it came anyway and things quieted down - well as quiet as a house with a 5 yr, 3yr and 9 month old can be and we enjoyed the wonder of our little girl's very first Christmas. Its those moments that you realize what is really important. Here is to everyone having the best year they can & taking the time to enjoy what is important to you! Lastly ~ I need to get a few pictures out from some past sessions. 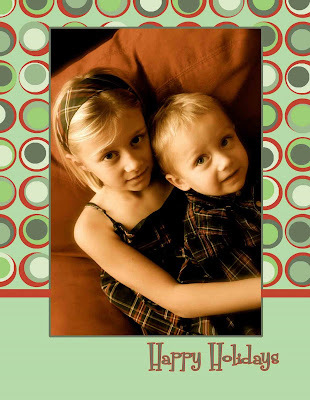 I will start with one from some of my favorite little ones ~ my niece & nephew.